The adoption and enforcement of national laws to address and punish all forms of violence against women and girls, in line with international human rights standards, is one of the five key outcomes which the Secretary-General’s campaign “UNiTE to End Violence against Women” aims to achieve in all countries by 2015. In May 2008, the United Nations Division for the Advancement of Women of the Department of Economic and Social Affairs (UNDAW/DESA) and the United Nations Office on Drugs and Crime (UNODC) organized an expert group meeting in Vienna, Austria, on good practices in legislation on violence against women. That meeting prepared a model framework for legislation on violence against women, including detailed recommendations, commentaries and examples of promising practices. The framework contained two types of recommendations: those that are applicable to all forms of violence against women; and those that are specific to domestic violence or sexual violence. 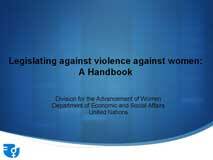 In 2009, based on the work of the expert group meeting in Vienna, UNDAW/DESA developed a Handbook for Legislation on Violence against Women. This Handbook, with a foreword by Deputy Secretary-General, Dr. Asha-Rose Migiro, intends to provide all stakeholders with detailed guidance to support the adoption and effective implementation of legislation which prevents violence against women, punishes perpetrators, and ensures the rights of survivors everywhere. It is specifically hoped that the Handbookwill be of use to government officials, parliamentarians, civil society, staff of United Nations entities and other actors in their efforts at ensuring that a solid legal basis is in place for tackling the scourge of violence against women. The hard copy version of the publication is available. In May 2009, UNDAW/DESA and the United Nations Economic Commission for Africa (UNECA) convened an expert group meeting on good practices in legislation to address harmful practices, at the United Nations at Addis Ababa, from 25 to 28 May 2009. Based on the outcomes of that meeting, a supplement to the Handbook has been developed. This Supplement on legislation on "Harmful practices" against women should be read and used together with the Handbook for legislation on violence against women. c) discuss specific recommendations for legislation on sexual violence. Viewers are advised to watch the videos in sequential order in order to receive a full briefing on the contents of the model framework for legislation. A PowerPoint presentation on the Handbook is available below which presents the contents of the Handbook, and key recommendations of the model framework for legislation, in a concise manner.